The University of Calgary is about to become a leader in training experts in wearable technology — a fast-growing industry. As the director of the University of Calgary's Running Injury Clinic, Reed Ferber noticed something way back in 2009. "Runners were using wearable technology — the Nike chip was the first type of wearable technology. They were not going on their runs if they forgot their device at home," Ferber said. "So [I realized] these devices are changing behaviour of these athletes." Close to a decade later, Ferber revealed Monday the University of Calgary has received funding from the federal government in the form of a Natural Sciences and Engineering Research Council (NSERC) CREATE grant to train 80 graduate students over the next six years to become experts in the field of wearable technology — which has exploded into a multi-billion dollar industry. "We're talking about Fitbit, and Garmin and Apple Watch — and countless companies that are popping up almost on a daily basis," he said. 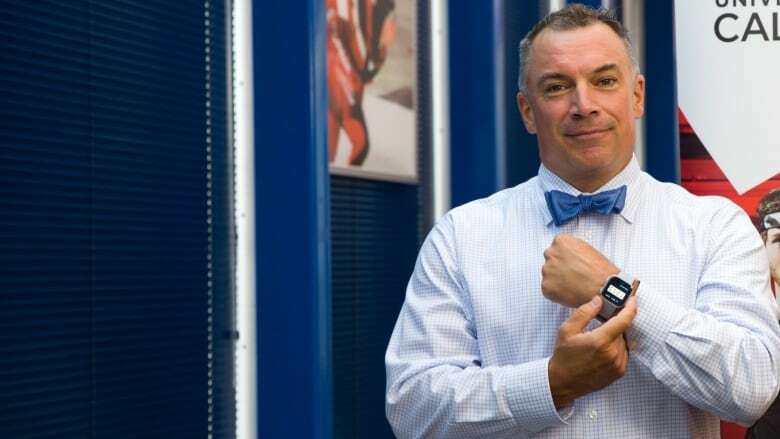 "They need well-trained graduates who understand data science, understand the technology, understand the entrepreneurial side of wearable technology — and that's what the [U of C's] training program is all about: combining those three programs together: data science, kinesiology and entrepreneurship in order to develop our next generation of wearable technology experts." Ferber will work with a number of other researchers from across the university campus to help train students, he said. "I'm leading a team of 10 other researchers from across campus, from engineering, to the faculty of science, nursing, where we're bringing together a very integrated team — we have data science experts, data visualization experts, kinesiology and biomechanical experts and engineering experts, all brought together [under one program]," he said. While wearable technology currently is best known for counting to 10,000 steps, Ferber sees it moving to new uses in coming years. "The really unique application is going to be in the area of health care and injury rehabilitation and prevention: how can we use a simple device to help somebody prevent an injury or rehabilitate from surgery or from an injury? "That's really where the field is going to turn to in the next four to five years." The first class, recruited from a variety of disciplines, starts this fall. "They're coming from New Zealand and Iran and Canada — all over the place," he said. "We're either recruiting data scientists and training them in kinesiology, or kinesiologists and training them in data science, and we're training them all in entrepreneurship." Among those students is Teague Foreman, a kinesiology major in biomechanics. She said one of the best features of wearable technology is that it changes the game when it comes to gathering data. "There's a lot of opportunity to collect a lot of data, in real-world settings, not just in the laboratory," she said, which differs from the bulk of her experience, gathering data in self-contained laboratory settings. "Working with wearables is going to round me out as a potential employee incredibly well. I have a lot experience in lab settings … but since wearables are the future, it will give me a good stepping stone to be hired by industry." Ferber said the biggest problem may be convincing students to finish school. "We currently have 24 companies — Canadian and international — that are involved in this new NSERC CREATE program, and they're looking for us to recruit these students, begin training and then they'll take them for internships ranging from one to four months, in order to help to integrate into their programs — and potentially hire them. "The biggest problem we actually face is these companies are so eager to have these students, I need them to return from these internships to complete their studies." On Sept. 9, during the University of Calgary's alumni weekend, Ferber will host an event explaining the benefits of using wearable technology to support healthy living. He'll be joined by Hal Johnson and Joanne McLeod of the Amazing Race Canada and Body Break, who will share some tips for creating healthy habits.